An appropriate start to this blog as this is the kind of weather we are getting this winter. I observed this tractor parked in a field whilst on a cycle ride. Love that snowy header Roy! The tractor just makes me smile! Its an old Massey Ferguson Evie. 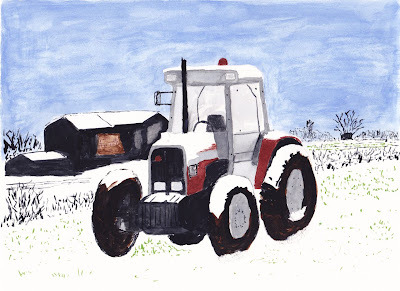 The tractor; when you told Evie it is an old Massey Ferguson reminded me of the time my uncle, who was used to driving a team of horse's to dig the potatoes rows, drove poor Massey into a tree at the end of a row as he hollered "wow" boys "wow" !! Of to a great start Roy!! Nice..
Lovely header, lovely beginning. A neighbour of mine on a croft in Scotland used to drive an old Massey Ferguson, the Fergie, which belched flame out of the exhaust every so often. It looked frightening to me and my husband but Fred, the crofter, said it just cleaned it out a treat!! Lovely! I like the elements...just as in your photos.